I’ve gotten a lot of use, and compliments, out of my ThinkGeek inspired backpack from The Legend of Zelda: Breath of the Wild. However, I’ve always been the kind of guy to carry just a few essentials in an easily accessible bag. 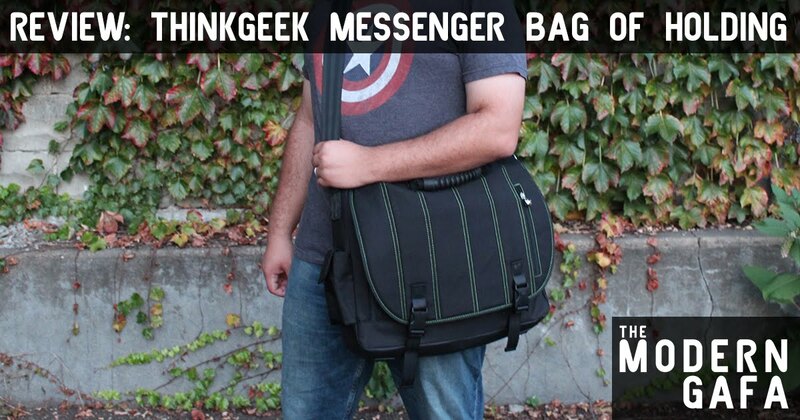 Luckily, ThinkGeek sent me another bag to review that is way more my style: the Messenger Bag of Holding. Disclaimer: I was sent the Messenger Bag of Holding courtesy of ThinkGeek. Opinions are my own. I’ve been using the Messenger Bag of Holding for about a week now. It took a while for me to get the strap adjusted to the way I like it, but now it’s in the perfect sweet spot. 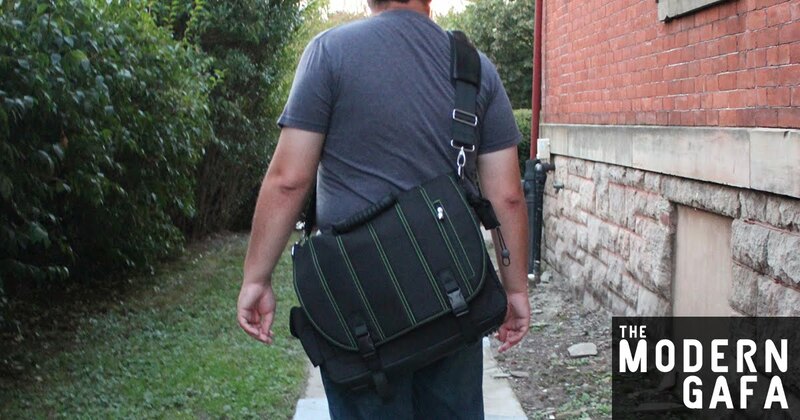 The bag is really comfortable and easy to throw over my shoulder and head out the door. The bag is 100% polyester, in black with a nice green trim. The inside is decorated with a pattern of d20s, to remind you of its Dungeons & Dragons inspiration. The main compartment is divided into two sections, one of which is padded for laptops. The website says it fits up to a 15-inch screen, but my 17-inch MacBook Pro fits perfectly. On the front, under the flap, is a zippable organizer section with areas to hold pens and small notebooks or portable chargers. On one side is a little pouch and the other is this weird strap that even the official ThinkGeek website isn’t sure what to do with. There is not as much room in this one as the Zelda bag, but it’s more for day to day travel like commuting to work and stopping by a comic shop on the way home. There is a handle on top that means it easy to grab and go. So far it’s been perfect for day to day use and makes a wonderful traveling laptop case. Click here to get your own Messenger Bag of Holding! Messenger bags aren't your thing? ThinkGeek has an entire new line of Bags of Holding, including a backpack and some other pretty cool looking things.